You could say that I love bread just because I’m French but there is definitely more to it. Soon after I was born, I was spending time in the laboratory of my grandparent’s bakery in the South of France. At family dinners I was quickly reminded that I needed to eat my bread so the baker would not be out of business! I learned as well that a decent French bread had a nice crunchy crust with a few holes and well cooked. My grandfather hated undercooked bread, meaning too soft. Yet, baking bread came back to me like an itch to scratch. I still wanted to make my own! I finally found a great recipe that is not too complicated and that I’m proud to share with you. I use a Bread Machine with a dough program. 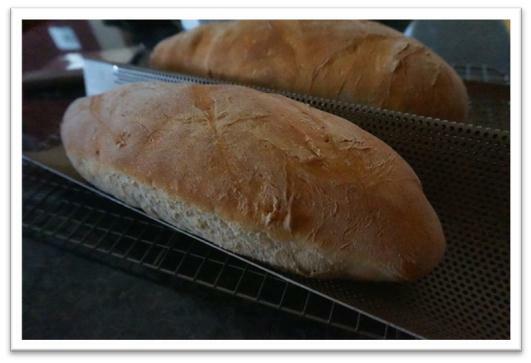 If you love making your own bread, it is a good idea to indulge yourself with one. I got my bread maker in 2006, it is a Cuisinart “convection breadmaker”. It costs about $100 and I believe is a very good investment. I’ve had it for 7 years and it works like a charm. A breadmaker really helps in terms of controlling your environment. 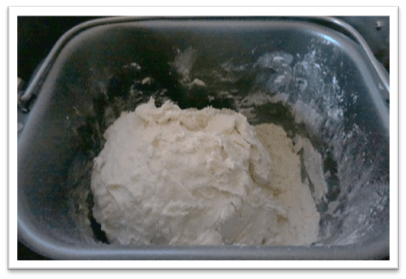 Without going into the chemical complexities of making bread (I’m not Alton Brown), bread dough is tricky since it is very sensitive to moisture and external temperature. Having a machine with a dough cycle helps to maintain the proper temperature and moisture level needed to prepare the dough. Besides, the breadmaker will deliver the right amount of kneading. Mine has 2 dough cycles. The first is just called “dough cycle”, which lasts between 1h25 to 1h40 and the second is “artisan dough” which lasts up to 5 hours. I personally used mostly the first one. The artisan cycle is nice is you have the time, since it can develop the acidity in the bread dough even more than the regular shorter cycle but frankly the simple cycle suffices. One essential reminder: always use a digital scale and please ditch your cup system for measuring! Weigh precisely the flour and water. Add the dry yeast to the water. Add the liquid to the flour in the maker mixing bowl. Then add the salt. Pour all in the machine. Start the program. With a spatula, make sure that during the first minutes the flour and liquid get well mixed. TIP: always throw a kitchen towel on your machine, it helps if you were to have any drafts nearby. Once the program is done, put the dough on a slightly floured sheet. Divide in half. I use a pastry scrapper for this. Work both dough separately. 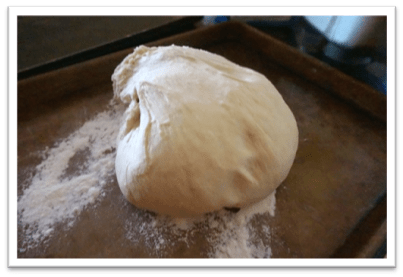 You can start kneading gently the dough for a couple of minutes. Fold the dough on itself twice. Start shaping into a “fat” baguette form. It’s not gonna look perfect and don’t worry about it! Seriously! Put your two baguettes into a baguette mold as seen in Picture 3. You can buy these pretty much anywhere. 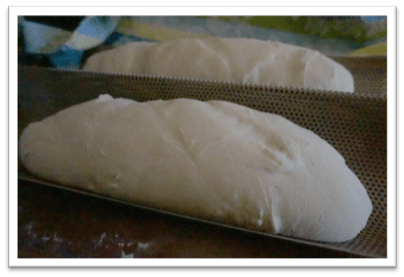 I personally use the brand Goldtouch® Nonstick Perforated French Bread Pan. I’ve had them for 4 years and I’m very happy with it. Put a clean kitchen towel on the dough. And let it rise in a warm environment (I’d say at least 72F) for about 45 to 50 min. Again the towel prevents the dough from getting drafts which is detrimental to the leavening. Turn on your oven to 425F and place on the bottom rack an empty pan. Then timing is everything!! Now your dough is nice and puffy. Remove the towel. Fill up half a glass of water and throw it in the now very hot empty pan. Close immediately the oven. Quickly grab the bread pan and throw gently into the oven. Close as fast as you can. Cook for 25 to 35 minutes. You will have to check because NO oven is the same, hence the large time frame. You’ll know it is cooked well once you get the right color on the outside. Once it is out, cool off on a rack and enjoy with wine and cheese bien sûr!! TIP: To get a more rustic look, you can sprinkle some flour on it. Enjoy your OhlàlàFood homemade baguette! At last! Something clear I can unseddtanr. Thanks! I believe that youtube is a great tool for someone curious in watching or uploading videos. I have been making use of the web-site for years now, and still think it is doing a good job!